All of my sweety fellows have you follow market getting change in his price direction? I hope your trade going on very well and withing a few hour weekly bonus will enter our trading account. Just make a standard trade plan who are zero in balance. In the meantime EU got success breaking the price level 1.1285. So I rearrange my trading setup and bought the price. Who are holding their buy trade for a long time they now start to laugh. I am not so worried because a very few pips I lost that could not hamper my equity. My oil trades not in favor even going up and show my imaturity in oil. If the price d chart I close that. Dear, A great support, required correction and how ot manage mind when the bad time come you all have given me always, Hope It would not break for me. Good afternoon all and good bye for this week, see next week with new analysis. 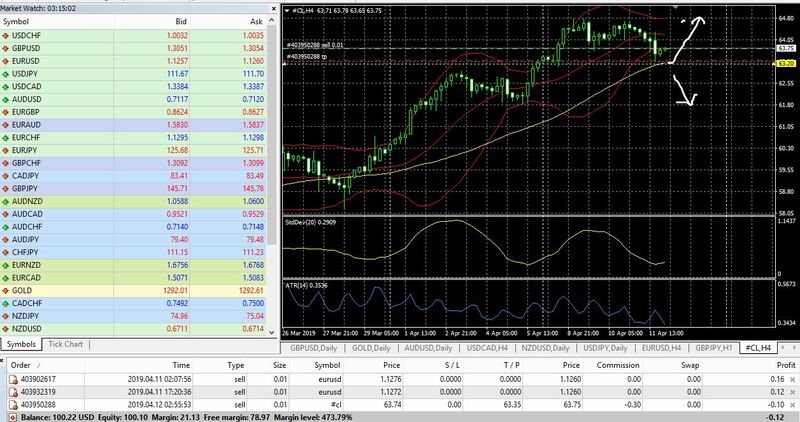 EURUSD currently moving upward with strongly, so that i think at this moment taking buy decision will be good for us, actually today i will not open anymore trade, because i am still on floating losses in different pair, next week i will try to choose this pair for trading, i hope from your buy trade you will make successful profit from this pair. The following 7 users say Thank You to zahid4x for this useful post. Good after noon mate thank you so much for greeting. Yes today is bonus day we all will be credited soon. Yes I was holding my buy trade on EURusd just closed it manually because I thought this is enough for me. I waited for this move for so long finally I got it. Dear I will wish you good luck for oil. Oil is like need to be avoided because it neither give us good bears nor bulls. But still over all trend of oil is bullish I hope you can cope with. The following 6 users say Thank You to fragile for this useful post. Yes EURUSD break the level of upper band and price is moving at 1.1312+ , i think this is good buying zone and good setup right now, selling EURUSD at this stage is not a good idea but some of the positional or long term trader might think about it. I can see that technique analysis is giving us buying indication,price is reaching at 1.1397 and i think it is possible to reach that level soon. I can set a target level today at 1.1355. The following 3 users say Thank You to FxBD for this useful post. All no ! beause today is a happy day, Our weekly posting bonus will be added with your trading account. So guys all take my love and . I am out from real trading for several day and like me there many of us who meet with margin call and waiting for another bonus money. Dear all You will be agree with me that in this week maximum pair hold their consolidate mode which people dislike most except scalper. This is true, another displeasure things a couple of trader out there who extremly bullish on EU but they very much frustrated. They want to see the price at 1.1300 rate. Dear, I hold my selling trade with EU. Market slowley landing but I could not expect for more falling. In the meantime in price structure a bearish inside pin bar has been formed but its action is not seen notably. Mate, Few minute ago I take buy trade with oil. I found there price weakness at top side, 200 ema little bit below from the current price. So for creating strong movement at upper side price need to meet with 200ema and that will he while my TP will be hit with the market. Is looking confusing to you? just share your valuable view about the pair. They ask the private about the Euro-Dollar. We mentioned from the beginning of the week the scenario of the uptrend and the breach of the highest 1.1284 will push to 1.1315 - 1.1325 and currently the price is at this price is expected to settle on today .. The following 23 users say Thank You to android for this useful post. Yes, the eurusd bulls should laugh now. It was rough but it eventually paid off. The bullish journey of the pair has just started. The formations on the daily chart is quite promising with targets going above 1.1440. This is the time to find good buy opportunities on the pair. The following 2 users say Thank You to forexguy9 for this useful post. weekend over and the market started, bull and bear has started their fighting already. In a new day, good morning to you all and welcome to another profitable week. Like yours, I got the highest bonus money 142.6$. Truly after a weekend, all are very fresh and fit to fight. Dear visitor of my journal, last week I got a very remarkable response from you and feel proud of becoming a member of mt5 forum. In this week I will get the same response. The following 27 users say Thank You to amiron56 for this useful post. Congratulation for your weekly bonus I show this week you got 142$ this really big amount for you hope it's will be help your trade. I show your Gold analysis you just take a buy entry. But I think this not perfect time for take buy entry. We show gold just try to go down it's already broke the 1290 level and continue go down hope it's will be quickly touch the 1280 level if it's can broke this level so it's will be hit 1250 area. But If it's can't broke this level so it's will be again go up from this level and we will take buy entry which can give us good profit. But form current level take buy entry is now good for us. Hope you will be control your risk and loss. Best of good trading. The following 11 users say Thank You to newdream365 for this useful post. Good morning and happy monday to you mate. OMG! how did you do it getting $142 bonus per week, I'm amazed and speechless. I believe you deserve it because you bring so much joy to this our beloved MT5 Forum and I wish you can get higher bonus this week too. For me EURUSD will continue to go up even testing the 1.1400 resistance this week but still a downtrend retracement is possible. I think most of us here are preparing to buy the EURUSD or maybe some of them already have a buying positions since friday. Let's hope that everyone can profit to this major pair. The following 6 users say Thank You to balut for this useful post. The following 4 users say Thank You to Rizwan Irshad for this useful post. Hello Amiron56, right now EURUSD is in the resistance level on 1.1325 there are chance it will make retrace first before starting to going up again, we can watch that retrace for good entry place. And For GOLD in my opinion it is still bearish right now probably until resistance level on 1283 so be careful for your trade bro. Good luck for you. The following 4 users say Thank You to enlight for this useful post.